I haven’t had a lot of time to crochet anything at all, and to be honest I wasn’t really up to it anyway. It seemed like concentrating and spending time on it felt wrong, and more like an obligation than something that was supposed to distract me from my mind. I also baked chocolate chip cookies (I might make a post about them one day), and I took a cup and drew Sherlock’s silhouette on it. Because Sherlock is awesome, and how can you not love him (original Sir Arthur Conan Doyle’s version, as well as, BBC’s version of him). 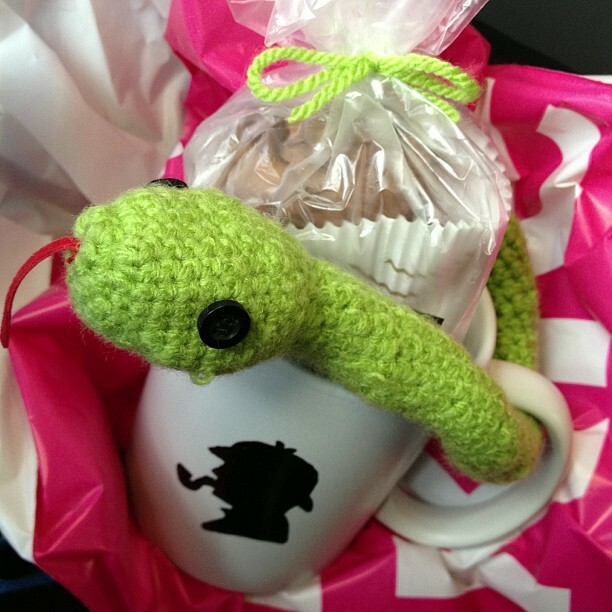 I had to start twice while making this snake, because I managed to end up with a huge head – and keeping that would have meant spending weeks on finishing it and it wouldn’t have looked as cute as this one. (Well, either that, or a few days and then ending up with a lot of pain). I hope that my lovely SSSW liked it (well, she seemed like it – which made me very glad), and I hope that she is going to have a great year because yes, she definitely deserves it. I’m not an expert when it comes to crocheting and to be honest, it took me a while (as in, lots of frustrating hours) to get the hang of it and to understand what the abbreviations stand for when it comes to patterns. Still, the fact that I decided to teach this myself was definitely worth it, because the act of crocheting is really soothing and a good way to spend some calm hours thinking about everything and nothing. For this octopus, I orientated myself on this pattern on ravelry.com (you may have to actually register for this site to be able to view it), although I only used it for the legs, as I managed to crochet the head without an existing pattern (it is, indeed, not that difficult after you’ve only been able to crochet balls for weeks). 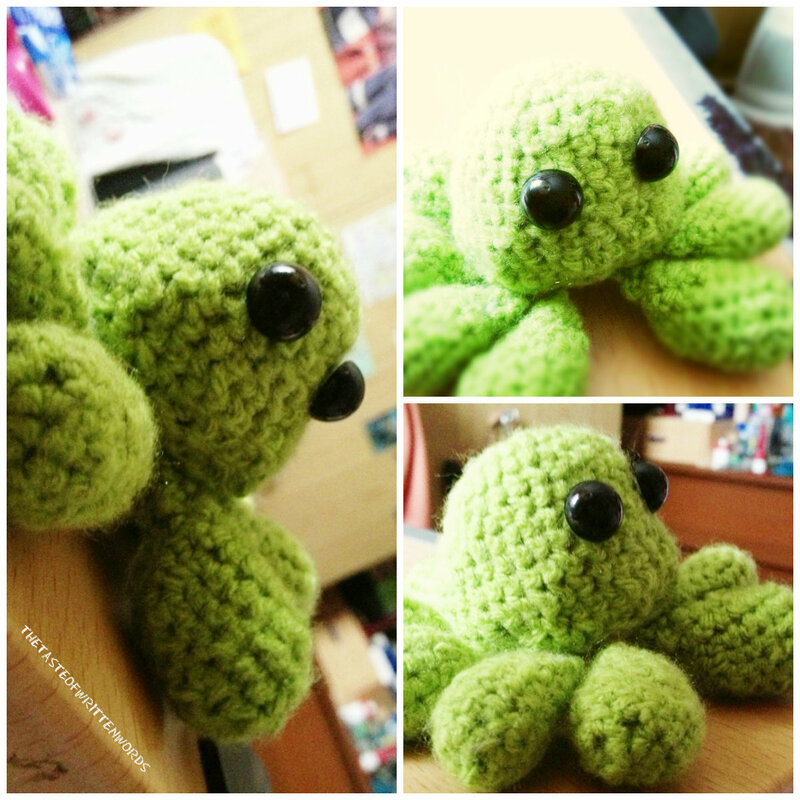 Some of the legs are bigger than the other ones, and his eyes are not yet sewn properly to his head, but I still think that he looks utterly adorable.